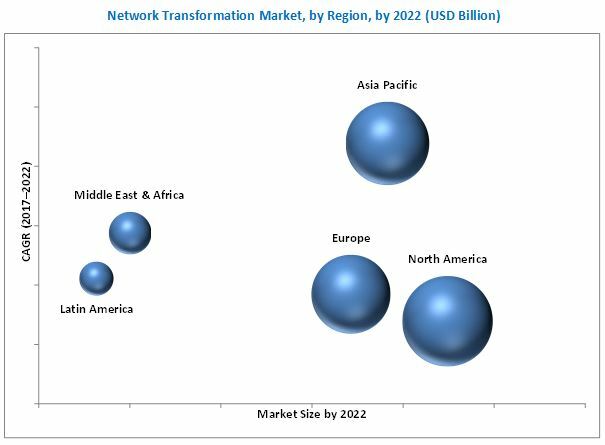 [153 Pages Report] The network transformation market size is expected to grow from USD 4.28 Billion in 2016 to USD 66.86 Billion by 2022, at a Compound Annual Growth Rate (CAGR) of 61.9% during 2017–2022. The base year considered for the study is 2016 and the forecast period is from 2017 to 2022. The main objective of the report is to define, describe, and forecast the network transformation market size by components (solutions and services), organization sizes, verticals, and regions. The report provides detailed information on the major factors (drivers, restraints, opportunities, and challenges) influencing the growth of the market. The report attempts to forecast the market size with respect to the 5 main regions, namely, North America, Europe, Asia Pacific (APAC), Middle East and Africa (MEA), and Latin America. The report strategically profiles the key market players and comprehensively analyzes their core competencies. It also tracks and analyzes the competitive developments, such as joint ventures, mergers and acquisitions, and new product developments, in the market. The network transformation market includes various vendors providing network transformation solutions, including C-Ran, SDN & NFV, and Network Automation to commercial clients across the globe. Major market players such as Cisco, Juniper Networks, HPE, Huawei, IBM, Dell EMC, NEC, Intel, Nokia Networks, Ericsson, Samsung, FUJITSU, Ciena, Accenture, GENBAND, AT&T, Arista Networks, and 6WINDS have adopted partnerships, agreements, and collaborations as key strategies to expand their market reach. These Network Transformation Solutions Vendors are rated and listed by us on the basis of product quality, reliability, and their business strategy. Please visit 360Quadrants to see the vendor listing of Network Transformation Solutions. Further breakdown of the US and Canada markets into solutions, services, organization sizes, and verticals. Further breakdown of the UK, Germany, and France markets into solutions, services, organization sizes, and verticals. MarketsandMarkets forecasts the global network transformation market size to grow from USD 6.01 Billion in 2017 to USD 66.86 Billion by 2022, at a Compound Annual Growth Rate (CAGR) of 61.9%, due to increase in the adoption of BYOD policy, rise in adoption of ITaaS and virtualization, and the collaboration among market players for the development and promotion of next-generation networking solutions. The network transformation market is segmented on the basis of components (solutions and services), organization sizes, verticals, and regions. The solutions segment is further segmented into SDN & NFV, C-RAN, and Network Automation. The SDN & NFV solution segment is further segmented into Software and Physical Appliances. The C-RAN solution segment is further categorized into Centralization and Virtualization solutions. The SDN & NFV solution segment is expected to hold the largest market size during the forecast period. SDN transforms the Wide Area Network (WAN) design by decoupling the control and data planes, centralizing network intelligence, and abstracting applications from the underlying network infrastructure. By leveraging SDN data centers, telecom operators can gain enhanced network programmability, automation, and control over their network. Moreover, SDN enhances the scalability and flexibility of WAN which further improves the network performance and availability. NFV is implemented by decoupling software and hardware as an abstraction of the network function. 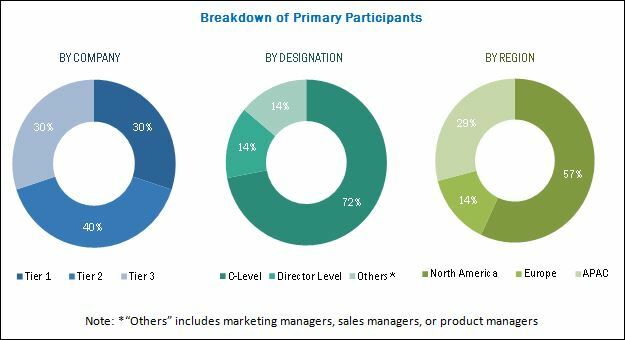 The network transformation market is expected to witness a traction, due to the collaboration among market players for the development and promotion of next-generation networking solutions; and a growing adoption rate of ITaaS, BYOD policy, and virtualization. The network transformation reconstructs the network architecture based on data center-centric ICT infrastructure, where information is stored, processed, and exchanged as well as service processing and business transactions are conducted in data centers. Data center-centric virtualized infrastructure is the foundation of the future network architecture. The global network transformation market is in the growing stage. One of the core parts of Network transformation is 5G Networks. They are in the development and testing phase. Leading telecom operators and technology players are testing various 5G networking solutions. The roadmap toward 5G comprises the common motive to support multiple access networks that are transparent to end-users. Multi-connectivity and aggregation solutions are the key ingredients for the development of 5G networks. In 2017, North America is estimated to have the largest market share in the network transformation market owing to growing trends, such as BYOD; and increasing adoption of smart connected devices and IIoE. The US is the early adopter of new technologies. Enterprises in the country have adopted new technology solutions for enhancing the manageability and flexibility required for adding new network capabilities and capacity. Moreover, increased budgets and grants have encouraged various leading players to make significant investments in the region. Network transformation has seen vast applications across various verticals in the US. For instance, UBM Tech, a US-based global media company, has deployed network automation solutions to enhance the manageability and flexibility of its networking environment for its flagship network technology trade show, Interop ITX. Following the US, Canada is expected to have a major share in the network transformation market in North America. Canadian companies are improving and optimizing their business networks by utilizing network transformation solutions. APAC is expected to witness growth at the highest rate, owing to the rapid development of the IT infrastructure and the adoption of new technologies, along with increased investments in large scale infrastructure and R&D projects by vendors in the APAC region. Europe, MEA, and Latin America are also adopting network transformation solutions at a significant pace. Lack of skills and expertise in next-generation networking solutions is likely to be the main restraining factor for the growth of the network transformation market. However, the recent developments, new product launches, and acquisitions undertaken by the major market players are expected to boost the growth of the market. The study measures and evaluates the major offerings and key strategies of the major market vendors, including Cisco, Juniper Networks, HPE, Huawei, IBM, Dell EMC, NEC, Intel, Nokia Networks, Ericsson, Samsung, FUJITSU, Ciena, Accenture, GENBAND, AT&T, Arista Networks, and 6WINDS. These companies have been at the forefront in offering reliable network transformation solutions to commercial clients across regions.